A picture from our kitchen window! No, I am not Amish. If I were, I wouldn't be on the internet! Because the Amish try to keep apart from the rest of the world, there isn't much decent information on the net. In fact, there are more "joke" sites about the Amish than even tourist sites! To remedy that a bit, I've listed a few decent links (below) and provided a brief introduction. In the late 1500's, along with the more familiar reformation movements such as the Lutherans and the Calvinists, there was a more "radical" movement known as the Anabaptists. As the name suggests, they believed that baptism should come in early adulthood, when one is capable of making a meaningful confession of faith. In addition, they believed in complete separation of the church from affairs of the state, and refused to serve in the military. These beliefs led to considerable persecution. The Mennonites are a branch of the Anabaptists which began with the teachings of Menno Simons in Holland. Persecution led them to migrate to Switzerland and other areas. There are millions of Mennonites today, spread throughout the world. In the late 1600's, a group of believers in Alsace, led by Jacob Ammon, split from the mainstream of Mennonites on the basis of a disagreement concerning the practice of avoidance, better known as shunning: If someone persists in deviating from Biblical rules, his community must avoid all contact with him. This practice remains a part of Amish life today. Persecution led the Amish to migrate to Pennsylvania in the early 1700's, where William Penn promoted a spirit of religious tolerance. Later, others migrated to other parts of North America. Today there are some 100,000 Amish in the US and Canada. The Amish are actually quite extreme in their religious beliefs. For example, they take the Bible literally and do not permit marriage outside their religious community. There is an oral tradition called the Ordnung which establishes general practice, but there is no central organization, so each community develops its own details. The day-to-day language of the Amish is called Pennsylvania Dutch (from Deutsch, meaning German, not Netherlandish). Sunday worship circulates through the homes of the community, rather than taking place in a church. Perhaps the most distinctive belief of the Amish is reflected in the Bible verse "Be ye not conformed to the world," meaning that one should separate oneself in one's appearance and practices from the mainstream of society, conforming instead as well as possible to Biblical tradition. So, for example, the Amish do not collect social security, unemployment insurance, or welfare. Instead, each Amish community makes sure that everyone's needs are taken care of. In addition, education is controlled by the Amish community, in the form of small schools. Education does not usually extend beyond the eighth grade. From the point of view of mainstream society, the most impressive aspect of Amish life is the way in which they appear to be stuck in a time-warp: They make an effort to live in the fashion of the 1600's of their forefathers. They do not usually use automobiles, nor do they use electricity or phones in their homes. Instead, they use horse-drawn buggies, mules or horses to pull farm equipment, oil lamps to light their homes, and so on. Amish clothing is also distinctive: Women wear dresses, usually of a single bold color, a white apron, and black bonnets. The dresses use no buttons or fasteners other than straight pins. Men wear plainly cut black suits and flat-brimmed hats of black felt or straw. Men grow their beards but shave their mustaches. They prefer that tourists not take their pictures, however. They are not always consistent in their practices: While use of cars is prohibited among the adults, many of their children will drive until they commit to the Amish lifestyle, and adults have no problem with having other people drive them places. While electicity is taboo in the house, generators can be found in the barns, and telephones are sometimes kept in a shed at the edge of the property. And so on. But overall, the Amish are a pleasant, hard-working people. Their life-style is often an inspiration to those of us enveloped by the intense and often inhumane culture of the modern world. Although strictly speaking religious extemists, they do not proselytize and treat others in a polite and tolerant fashion. The same cannot always be said of people in the mainstream. 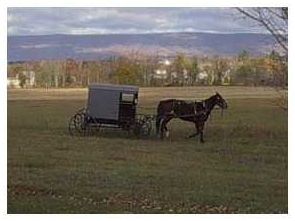 The Amish And "The Plain People" -- A Pennsylvania tourism site -- but with nice descriptions and pictures, including a detailed description of Amish wedding traditions. Welcome to the Amish Heartland Online! -- An Ohio tourism site -- but very informative and attractive. Origins of the Old Order Amish -- The origins of the Old Order Amish, an essay provided by the National Committee for Amish Religious Freedom. The Amish: Beliefs, practices, conflicts -- A look at the history and beliefs of the Amish, by the Society for Religious Tolerance. The Amish -- Bea Sheftel's lovely essays on Amish life. Very informative. Amish Country News -- Another Pennsylvania tourist site. Gives plenty of information about events in the area, some quite authentic. Amish Online -- The people from Discovery Online take a look at the Amish. A really cute page, it follows an amish family over several days. Nice for kids, especially. The Amish Farm and House -- All the details of daily Amish life, with many pictures. It's a Lancaster County tourist attraction, but very nice. Das alt Schulhaus an der Krick, by Heinrich Harbaugh -- A nice sample of Pennsylvania German on Dr. Paul S. Boyer's website. Amish in the Jungle -- Jordi Busqué, a photographer from Catalonia, has a website of photos and comments on Amish people who have settled in the jungles of Bolivia. Very interesting! He has additional photos of Bolivia, including Mennonite settlements. Amish Recipes -- Ellen Parr created this website with hundreds of authentic Amish recipes.